More than anything else, Homeland is about trust. What makes people trust each other? Do we give people our trust for rational, defensible reasons or because they’re deceiving us, pushing our buttons, telling us what they know we want to hear? Can we trust the show’s main characters to do the right thing — to be ethical and patriotic and act in the country’s (and their own) best interest? And on a creative level, can Homeland itself be trusted? Can we trust Howard Gordon and Alex Gansa’s now-Emmy-winning show to play fair with the audience, springing entertaining new revelations on us without making the characters seem inconsistent? And can we trust this drama, which last year often felt like it would have made a perfect self-contained miniseries, to keep its plot going for another year, or several more years, without seeming as though it’s running on fumes? How long can the Brody-as-volatile-sleeper-agent premise play out without making the writers look desperate and the show seem, well, kind of dumb? More complications on the domestic front: Brody used his political connections to get the at-risk Dana into an exclusive D.C. prep school that seems like an unofficial training ground for generations of powers-that-be. During a fairly lame chapel discussion of the Iran/Israel tension, Dana righteously counters another student’s maligning of Islam by saying that her dad is a Muslim. The statement seems so outrageous in context that pretty much everyone in the room dismisses it as a joke, but it’s serious business indeed, because Brody is a Muslim, and his secret after-hours practice of his adopted religion in his garage casts suspicion on him. 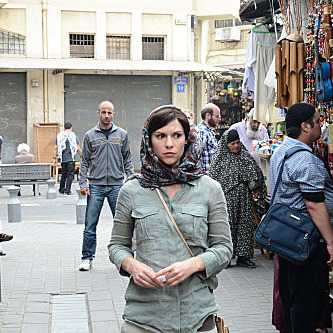 The “My dad is a Muslim” subplot was my favorite element in the episode, along with the chance to see Saul and Carrie in action on the ground in Beirut. Dana always had a touchingly tight bond with her dad — they’re obviously much closer to each other than either of them is to the household’s matriarch, Jessica Brody — and that relationship is showcased in “Smile” quite movingly. Dana didn’t mean to cause harm by blurting out her dad’s religion; she was just being a teenage girl, using the information she had in order to win an argument and trump a jerk in public. But the intense scene in which Brody reveals to Jessica that he is indeed a Muslim highlights the trust inherent in the father-daughter relationship. These two really do love each other, and despite all the pain that the family has been through, and the tremendous pressure exerted on the family by Brody’s war trauma and public ambition, it’s clear that their love for each other is pure and real. Brody and Dana’s trust in each other is deep and unaffected. Their relationship seems like the only major one on Homeland that’s not seriously undermined by suspicion and selfishness. The scene of Jessica invading Brody’s garage space and knocking his Koran to the floor in an argument confirmed that their husband-wife bond is volatile and maybe unsustainable; its mirror is that genuinely powerful closing image of Dana helping her father bury the Koran in the backyard, an image that gives this somewhat shaky episode a resonance it might not have had otherwise. Any image of burial and the grave is certain to carry intimations of mortality even if there’s no corpse in the ground. What I saw in it was both a practical, religious ritual (if a Koran touches the floor, it’s considered contaminated and must be buried and replaced) and a multivariant suggestion of the little psychological deaths that so many Homeland characters have endured since season one: the death of Saul’s marriage, the death of Carrie’s career, the death of Brody’s previous identity as a patriotic apple pie-type , and, more than anything else, the idea that when a person changes or engages in activities that lead toward fundamental change, what is really happening is a gradual murder or mercy killing of whatever the person was before, a killing and burial of an old self. But which Brody is being buried here? Is it all a charade? Is there, so to speak, a body in that gesture? As is always the case on Homeland, we have what feels like useful and true information, but we still aren’t sure whom or what to trust. * This post has been corrected to note that Brody has been elected to Congress, he is not an aide to the V.P.